First, my apologies for missing last week’s installment. Technology is great when it works, not so great when it doesn’t. Now to the business at hand. Loss can come in several forms and it’s not usually a word one wants to associate with motorsports. It came in two forms this week. Sadly, reigning PDRA Top Sportsman champion and five-time IHRA champion Ronnie Davis died on Sunday from injuries sustained in a crash on Saturday at PDRA’s Spring Nationals at Rockingham Dragway. He’d just completed a qualifying run in his 1963 Corvette when the car veered left after the finish line and then shot back across the track, going over the right side wall and barrel-rolling. Davis was instrumental in bringing Top Sportsman racing to NHRA competition, even sponsoring the class in the Southeast Division. Drag Illustrated writer/photographer Ian Tocher was also seriously injured in the incident after being hit by debris. He is being treated at UNC Medical Center in Chapel Hill and likely faces a long recovery. Racing has a way of sending cruel reminders of its inherent danger. Davis was a veteran driver in a car he’d campaigned for years. No matter how much experience a driver may have, anything can happen when one straps into one of these machines, be it drag racing, a stock car, or an open-wheel car. We all love the sport, competitors, media and fans alike, and we will all continue doing so, and there’s nothing wrong with that, but that price is always the elephant in the room. * The other loss comes in the form of the sudden retirement of Bob Vandergriff, owner of Bob Vandergriff Racing, from the sport. The team has been shut down and all employees released. BVR was fielding two entries in Top Fuel driven by Dave Connolly and Leah Pritchett. The recent death of friend and longtime BVR supporter Josh Comstock of C&J Energy Services caused Vandergriff to reevaluate his involvement in the sport. “I’ve missed a lot of things in my children’s lives over the years, and the desire to spend more time at home with my family has weighed on me greatly the last few years, and when combined with the struggles the oil and gas industry has been facing over the last 12 to 18 months, it seemed like now as the right time to retire,” said Vandergriff. There has been no word on the future plans of either driver so far. As for the Top Fuel category, the sudden loss of two cars calls into question the ability to draw a full 16 car field. The field already ran one car short in Phoenix, and only 16 cars have shown up for the remaining events. It will be interesting to see how many entries are present for the Four-Wides next week. This is a huge blow to one of NHRA’s marquee Nitro divisions, and a big setback in what has so far been a year on an upswing for NHRA. * NHRA and FOX Sports are already seeing the benefits of their new partnership as the DENSO Spark Plugs NHRA Nationals from Las Vegas scored the best viewership numbers for an NHRA event in 14 years. Sunday’s live finals broadcast logged 1,292,000 viewers, more than double what the event pulled in last year. Viewership has trended upward all season, with the first three events prior to Las Vegas brining in over 900,000 additional viewers over last season. More focus on drivers and their stories, more live coverage, and better time slots, including lead-in coverage from NASCAR for the Las Vegas event seem to be a successful formula so far to grow interest in NHRA drag racing. 2015 – Won two races and moved to fourth on all-time wins list in Funny Car. 2014 – Won category best five races, including three in a row at Charlotte 1, Houston, and Atlanta. 2009 – Won first Funny Car world championship after barely squeezing into the tenth and final Countdown spot. Some things most people don’t know about Robert: He’s much more than just a driver at John Force Racing. Robert Hight is also JFR’s president. He’s been with the team for a very long time. He worked as the clutch specialist on John Force’s car from 1995 through 2001. The team just happened to win championships in all seven of those seasons. He then became the facility manager for JFR as well as a test driver. 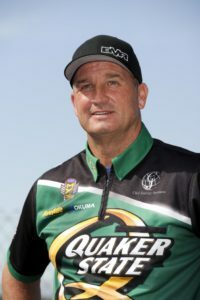 In 2004 he attending Frank Hawley’s Drag Racing School and then earned his Funny Car license at Topeka. He’s also bringing along the next generation of the Force family of racers. His daughter Autumn races a Junior dragster. The most unique event of the season, the Four-Wide Nationals, are next up on the schedule so it seemed appropriate to use this space to give a little preview of what’s in store, particularly if you have never seen your favorite NHRA drivers racing four at a time side by side. It might sound cliché, but this is what the world of drag racing is, in many ways. Sometimes it’s literal, like the Force family or the Schumachers or the Kalittas. Sometimes it’s not blood, but the common love of the sport. The thing is, unlike some other forms of motorsports, racers move around much more. NHRA this week, PDRA the next, something else the week after that, whatever rules the car will fit, so the bonds and the friendships carry across sanctioning body lines. Losses to that family have a widely felt effect. Previous Truckin’ Thursdays: What if the Truck Series Used Heat Races?